James Seok and Brian Yeun, the guys behind L.A.’s the Bun Truck, have parked their operation in a faux-grungy Koreatown space. 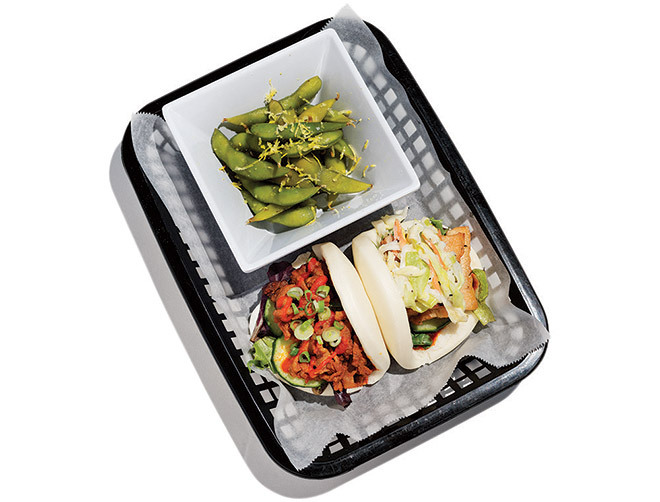 The specialty at the brick-and-mortar is the same: overstuffed Asian-fusion versions of China’s flat, steamed buns. Seok, a Morimoto alum, finesses each Dagwood-style pouch so that even bizarre combos work, whether it’s Korean grilled pork with tzatziki or panko-fried tomato with citrus slaw. Seok and Yeun say that their growing up as Korean Americans in working-class Detroit influenced the grub’s delicious cultural mash-up. That would explain the dessert of green tea ice cream with fried Oreos.